If you are a follower of angelsportion.com, then you’ll know that the Glenkinchie 10 year old has already been reviewed, and sadly, it wasn’t pretty. It truly was a test in reserved speech — that is, being truthful while still holding back because you don’t have anything nice to say and you’ve been taught not to speak if that’s the case. 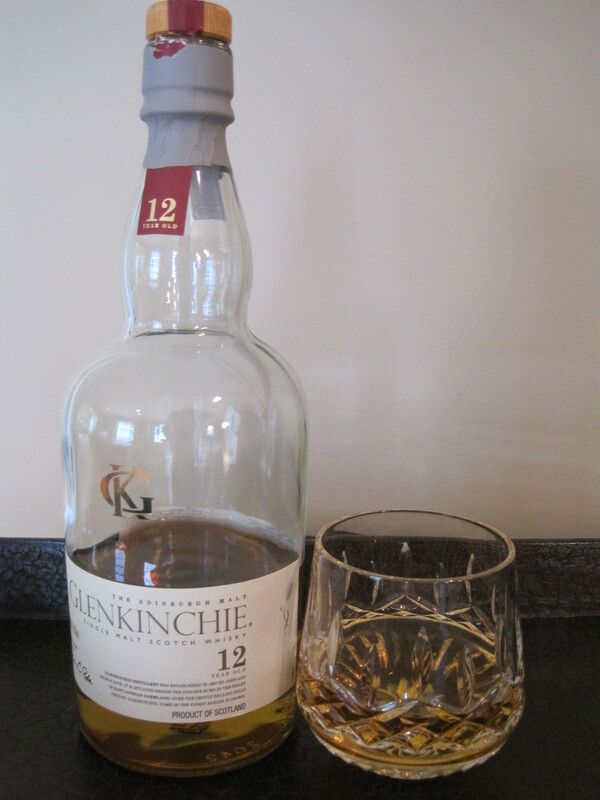 On the other hand, I was optimistic that the Master Distiller at Glenkinchie had experienced some sort of an enlightenment and had discovered that his distillery standard was useful for little more than a catnip replacement or signal-fire fuel and had decided to end its production, ultimately offering something in its place. The news of the Glenkinchie 12 year old edition hearkened my spirit to soar amidst the silver linings of the thundercloud that was the 10 year old. In the air-scooping lift of my optimism, I ventured toward the silver lining and I, too, experienced an enlightenment: It’s not silver — it’s tin foil that’s already been used to barbecue asparagus. Or, as I’d prefer to share: If at first you don’t succeed (Glenkinchie 10 year old), try, try again. If failure persists (Glenkinchie 12 year old), give up, sell your distillery to William Grant & Sons, take your money and the rest of your remaining whisky and repackage it as medicinal purification solution or the base element for paint thinner. Certainly you’d be able to make enough money that you could live quite comfortably for many years, at least until you decided to become the “Jack” of another trade. As I whisked up and into the cloud, being led by my nose to the gilded lining by of this 12 year old, being invited with a sweet, wine-like scent. But as I reached out to the sky to run my fingers through the sparkling flakes of silver twinkling above, my digits were ripped to shreds by the serrated edges of a harsh and tinny sip. I did manage to sense a sturdy piece of oak as well as a hint of fruit, but the grungy, rusty tin overpowered these possibilities. The finish was salty, or maybe I just got blood in my mouth. I’m not sure. I’m sorry, Glenkinchie. I so longed to love you. I so longed for a heavenly engagement, but as my airship flamed toward the earth, I knew I’d learned an important lesson: “If at first you don’t succeed…” Well, you know the rest. By the way, to become a supplier for Proctor and Gamble, you need only to go to http://www.pgsupplier.com and submit a proposal. Who knows? Or maybe send a note to William Grant & Sons to see if they are interested in acquiring a few new stills. The email is info@wgrantusa.com. It doesn’t hurt to ask. As scathing reviews go, this one is masterful. “…give up, sell your distillery to William Grant & Sons, take your money and the rest of your remaining whisky and repackage it as medicinal purification solution or the base element for paint thinner.” Bravo sir. The distillers at Glenkinchie really need to rethink their “flavors”, if not just pack up their stills and go home. Do you know by any chance if the bottle of 12 was an older version from before 2011? Based on the research I’ve done on this whisky, I think the 12 was introduced in 2007, but was quite rough until 2010. Most reviews from 2011 and on seemed quite positive. Whiskymag even awarded it Lowland Whisky of the year for 2013. Maybe Glenkinchie fixed their quality issues since then? I still have the bottle and label. I shall check. Are you hoping for a reconsideration? Not really. The reviews with this one are just all over the place and it’s to wonder if everyone is getting the same whisky. I just bought this as a gift for someone and I hope I didn’t make a mistake. Don’t risk it. Take it back and get a Balvenie of some sort.